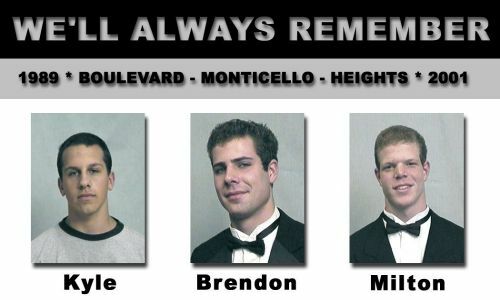 On the night of February 11, 2001 a tragic tragic auto accident took the lives of Kyle Barden, Brendon Benner, and Milton Carter. The three were all Cleveland Heights Hockey players and friends since grade school. The Cleveland Heights community was shocked and saddened by the event, but has come together in many ways to honor their memory and support those things that meant so much to Kyle, Brendon, and Milton. In addition, the Foundation has supported increased awareness of traffic safety through the distribution of dashboard cards (shown above) to schools and teenagers throughout the Cleveland area. For additional information on Foundation activities, donations, and contacts. Please follow the links on the Home Page.